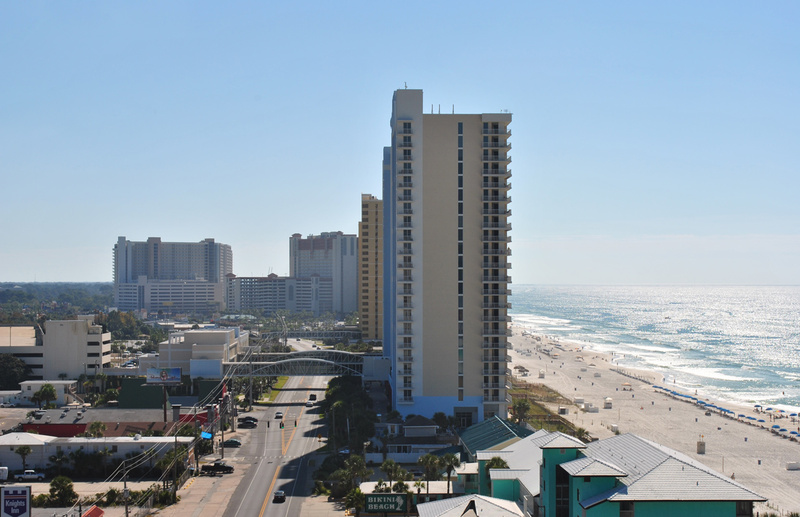 Front Beach Road (SR 30 / CR 30) comprises the main beach route through Panama City Beach. Photo taken 10/17/11. SR 30 is the state road counterpart of U.S. 98 throughout most of Northwest Florida. The designation stretches east from the Alabama state line at Perdido Bay to Perry in Taylor County. Exceptions occur at both Downtown Pensacola and through Panama City, where SR 30 accompanies U.S. 98 Business. A third section of SR 30 follows portions of Front Beach Road (old U.S. 98 Alternate) through Panama City Beach. U.S. 98 Alternate in Bay County was decommissioned by FDOT and AASHTO in 2006. Within Pensacola, Florida 30 follows Business U.S. 98 along Garden Street, while U.S. 98 overlaps with Florida 292 (Pace Boulevard), U.S. 90 (Cervantes Street), and Florida 289 (Ninth Avenue) to the north of Downtown. State Road 30A doubles as U.S. 98 (Panama City Beach Parkway) in western Bay County and along the U.S. 98 mainline around Panama City. SR 30 loops south of U.S. 98 at both cities, following Front Beach Road along the Panama City Beach gulf front, and representing the hidden counterpart of U.S. 98 Business through Panama City, Springfield and Callaway. Another portion of SR 30 was also relinquished from Front Beach Road through Sunnyside. The 3.805 mile long section removed from the state road inventory extends east from near the west end at U.S. 98 to the Panama City Beach municipal boundary near Chateau Road. The AASHTO Special Committee on US Route Numbering approved the Florida application to eliminate U.S. 98 Alternate in Bay County on October 27, 2006. The 16-mile route was posted until 2008, and some side road shields remain as of 2016. State Road 30 ends in Perry, where U.S. 19 & 98 (Byron Butler Parkway) intersect U.S. 221. There, State Road 55 takes over for both U.S. 19 & 98 southeast to Crystal River. A 2.7 mile long section of County Road 30 links U.S. 19 & 98 with U.S. 27 to the southeast of the Perry city limits as well. "FDOT to transfer Front Beach Road segment to Panama City Beach." Panama City News Herald (FL), July 14, 2016.